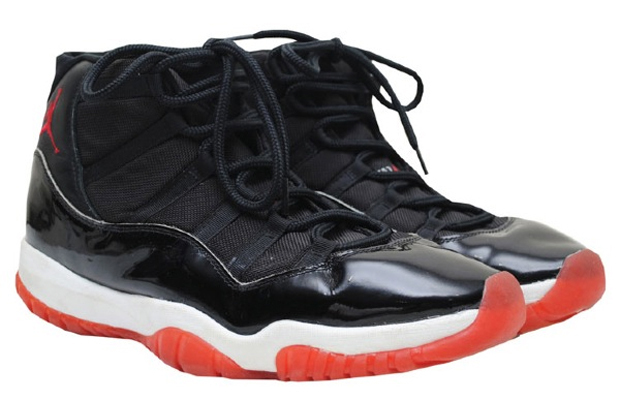 Follow Up : Michael Jordan’s Game-Worn Air Jordan XIs Sold for How Much? 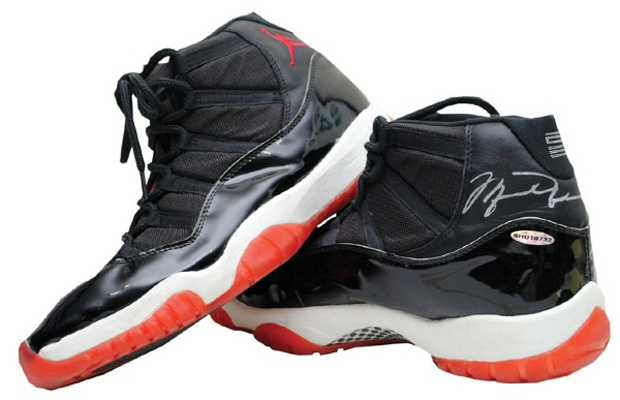 Earlier in the month, we showed you an auction for a pair of Michael Jordan signed, game-worn “Playoff” XIs. The sneakers, which were being auctioned by former NBA player Eric Snow, are from Game 3 of the 1996 NBA Finals where the G.O.A.T. dropped 38 on the then-Seattle Supersonics. The auction recently came to a close and let’s just say we’re not shocked at how much the sneakers fetched. The collectible Air Jordan sneakers sold for a total of $17,126. Considerably lower than the $104,765 that the “Flu Game” Jordan XIIs went for, but still far from chump change. 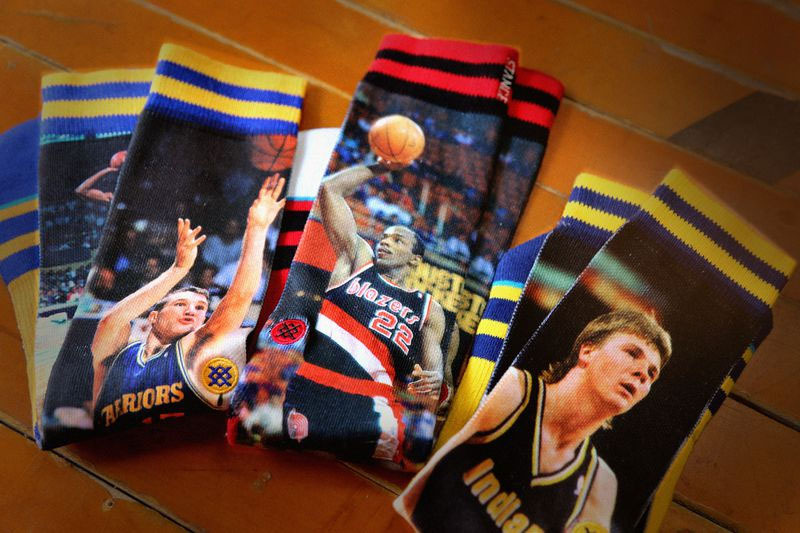 Stance unveils the third installment of their popular NBA Legends sock collection, featuring Rik Smits of the Indiana Pacers, Clyde Drexler of the Portland Trail Blazers and the Golden State Warriors’ Run TMC trio of Tim Hardaway, Mitch Richmond and Chris Mullin. The quest for an NBA Championship has never been an easy journey. Few have the strength, talent and teammates to win against the world’s elite athletes. Consistently regarded as the best to ever play basketball, Michael Jordan dominated the NBA throughout the ’90s, racking up six championship rings and six Finals MVP trophies over an eight-years span. 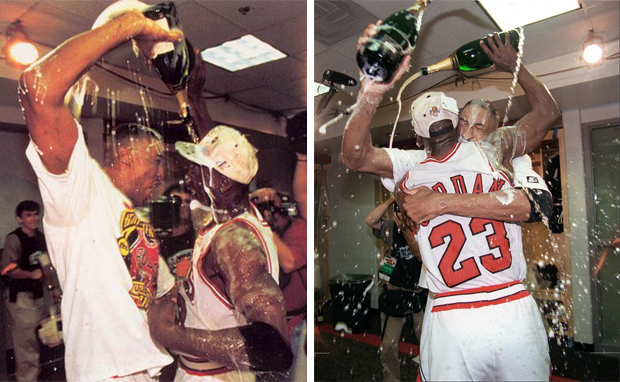 Each of those championship runs ended in similar fashion – with cigar smoke and champagne showers. 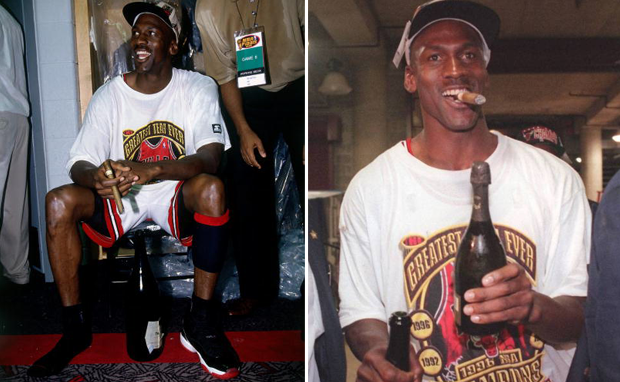 As a toast to Michael Jordan’s playoff excellence, and in anticipation of the release of the upcoming Air Jordan 6 “Cigar and Champagne” Pack, we revisit some of the best celebratory moments of MJ’s career. The Chicago Bulls defeated the Los Angeles Lakers in five games to pick up their first NBA Championship. Michael Jordan averaged 31.2 points, 11.4 assists, 6.6 rebounds per game en route to his first ever NBA Finals MVP award while rocking the Air Jordan 6. 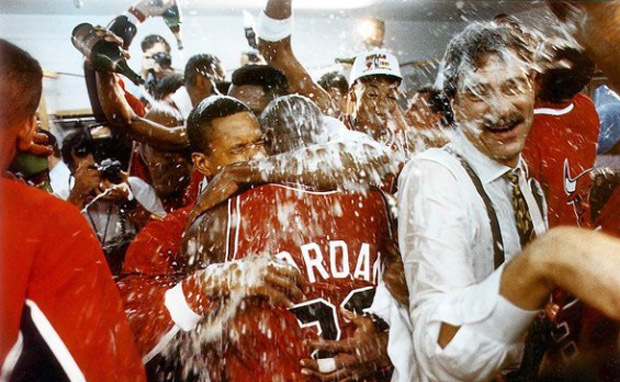 The ‘92 NBA season ended with the Chicago Bulls prevailing over the Portland Trail Blazers to win their second straight championship in six games. His Airness averaged 32.3 points, 6.5 assists, and 4.8 rebounds, claiming his second Finals MVP award while wearing the Air Jordan 7. 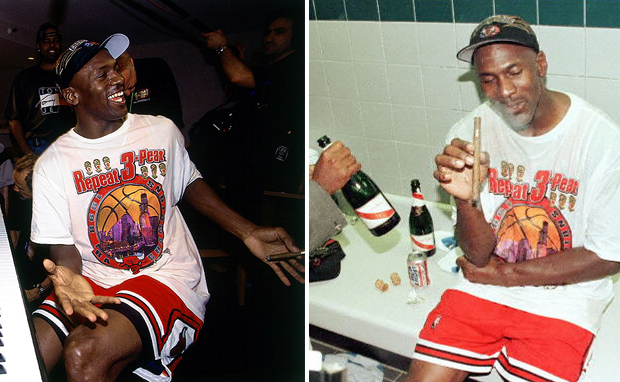 In the 1993 Finals, Jordan and the Bulls conquered MJ’s 1984 draft mate Charles Barkley and the Phoenix Suns in six games to claim their third straight championship. The Bulls were the first team to three-peat since the Celtics in the ‘60s. Jordan ended the series averaging 41.0 points, 6.3 assists and 8.5 rebounds a game, taking home his third consecutive NBA Finals MVP award while wearing the Air Jordan 8. After two years of watching the NBA Finals from home, the Chicago Bulls made their way back to the NBA’s biggest stage. This time, they defeated the Seattle Super Sonics in six games to take the Larry O’Brien Trophy back to the Windy City. 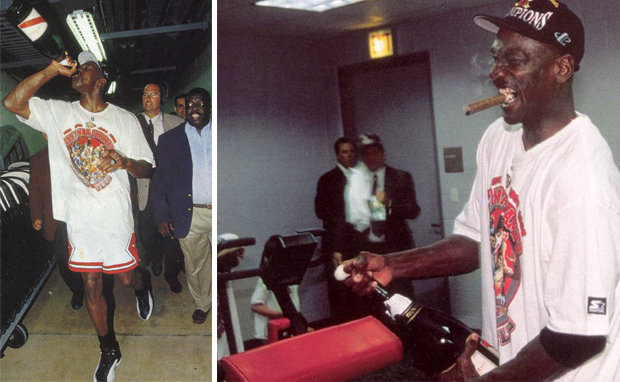 MJ was honored with his fourth Finals MVP trophy while lacing up the Air Jordan 11 during the championship chase. 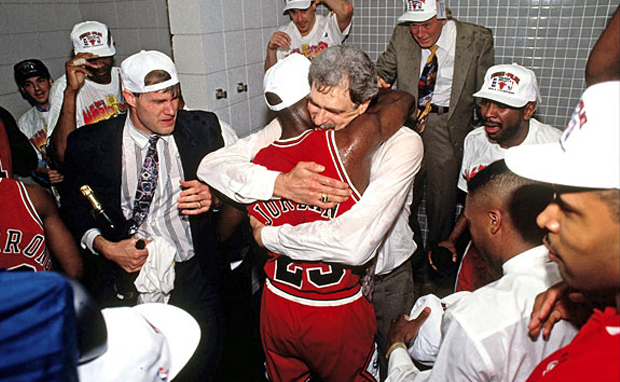 The Chicago Bulls went on to triumph over the Utah Jazz in six games in the ’97 NBA Finals. The world witnessed another stellar series performance from MJ, in which he averaged 32.3 points, 6 assists, and 7 rebounds a game, which propelled him to his fifth Finals MVP trophy. He did it while wearing the Air Jordan 12. The Utah Jazz returned for a rematch against the Chicago Bulls in the ’98 NBA Finals, but the result was the same as the year before. 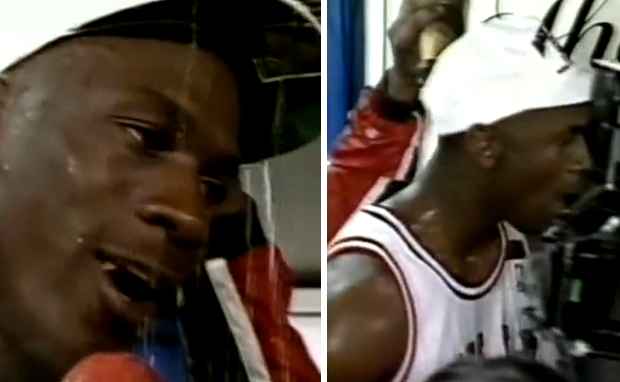 The series ended in the sixth game, with a pull-up game winner by Jordan. That shot went on to be remembered as the “Last Shot” by one of the best athletes to ever walk the earth…as a Bull, at least. His Airness graced the court in the Air Jordan 13 for a majority of the playoffs, but switched over the to the Air Jordan 14 for a portion of the finals. 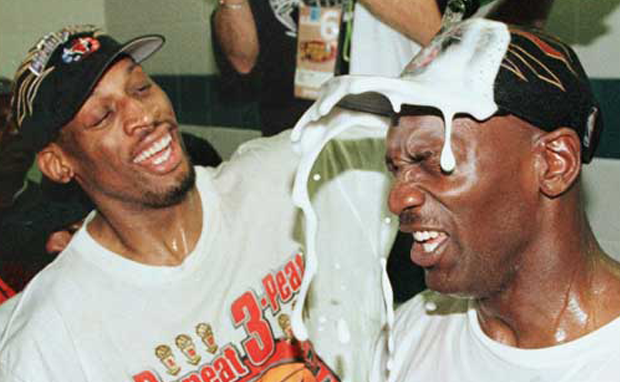 MJ averaged 33.5 points, 2.3 assists and 4 rebounds to earn his sixth and last NBA Finals MVP award. 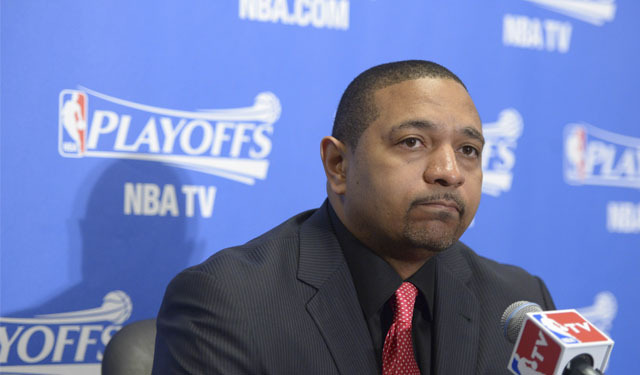 The Golden State Warriors have relieved Head Coach Mark Jackson of his duties, the team announced today. Jackson, who recently completed his third season as head coach of the team, guided the Warriors to a 51-31 record this season and a combined 121-109 record (.526) during his tenure in the Bay Area. Jackson was named the 24th head coach in the team’s West Coast history on June 6, 2011. Jackson had been at the center of rumors of conflict with the front office and ownership for months. Two of his assistant coaches, Brian Scalabrine and Darren Erman had been removed in the past two months. Scalabrine was reassigned after Jackson reportedly tried to fire him in front of Warriors players without clearing it with ownership, and Erman was caught recording conversations in what is reportedly an effort to illustrate the way Jackson and the rest of the staff were unermining his authority. Jackson finishes with a 121-109 record, 9-10 in playoff games and consecutive playoff appearances. The Warriors upset the Denver Nuggets in last year’s first round, and loss to the Clippers in the first round in seven games this season, despite the loss of Andrew Bogut for the season due to injury. Warriors owner Joe Lacob denied having made a decision about Jackson last week. Reports surfaced recently that Jackson had clashed with legend and front office member Jerry West over West’s presence at practice. 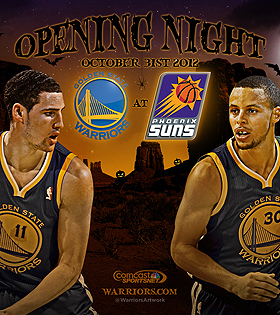 Tonight’s game will mark the first time the Warriors have opened a season on the road in exactly 11 years (10/31/01 at Portland). Earlier this week, the Golden State Warriors, Snøhetta and AECOM released the initial preliminary renderings of the new San Francisco sports and cultural venue that’s scheduled to open for the 2017-18 season at Piers 30-32. This area is in close proximity to BART, Caltrain and Muni stops, ferry terminals and the Bay Bridge, while also being located within easy walking distance of the Financial District in Downtown San Francisco.